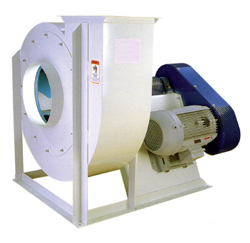 The RBO/RBA series of fans are excellent choices for many industrial applications. The RBO is an open type radial paddle wheel design and is extremely rugged. Applications include coarse materials, sawdust, sticky products or other abrasive materials. The RBA is an efficient modified radial fan design. RBA fans are excellent for relatively clean air containing light dust or fumes.